Some of you know that I’m on a journey to improved health. A year ago, I weighed 65 pounds more than I weigh today and had both Type 2 diabetes and high blood pressure. Today, I have neither of those conditions and feel better and more energetic than I’ve felt in a long time. In addition to more energy, I have a brand-new wardrobe. 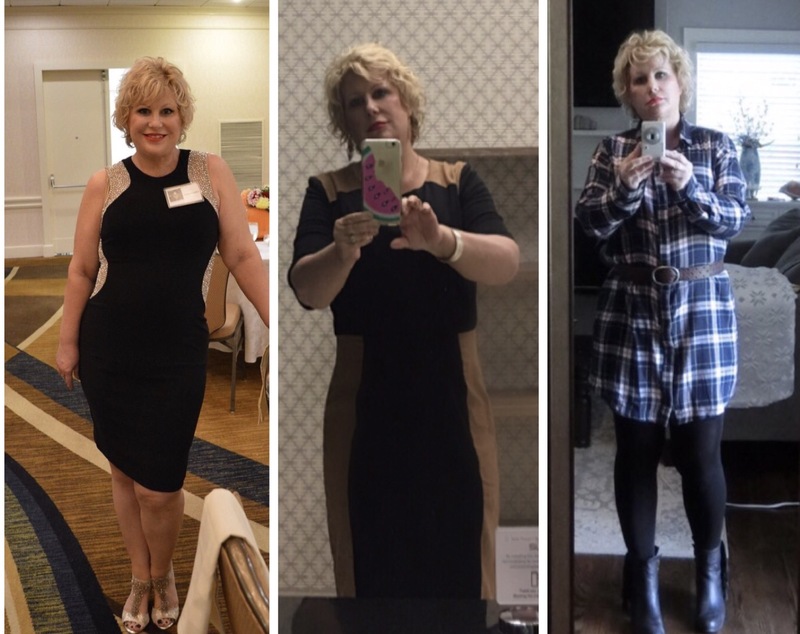 With the exception of a few one-size-fits-all wraps, nothing from my “before” closet works anymore. It’s fun to have more clothing options, but buying all-new outfits is pricy. I do a lot of shopping for basics at Nordstrom Rack, Steinmart, Marshall’s and other stores offering bargain prices. Then, I and mix and match the things I’ve found with more unique items from stores like Anthropologie, Urban Outfitters and Free People. I wanted to share these two looks because they demonstrate how easily one piece can transform an outfit. At left, I’m wearing my favorite Joe’s Jeans with a top from the Thalia Sodi Collection, which is sold at Macy’s. 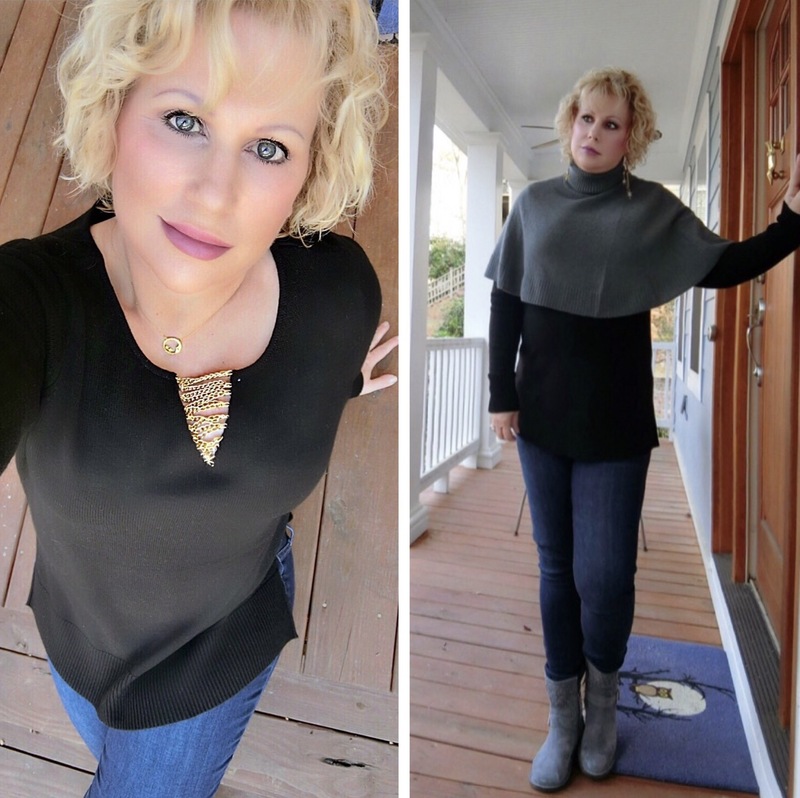 At right, I’m wearing the same sweater and jeans but they have a whole different attitude thanks to the Cullen cashmere capelet I picked up at Nordstrom Rack. 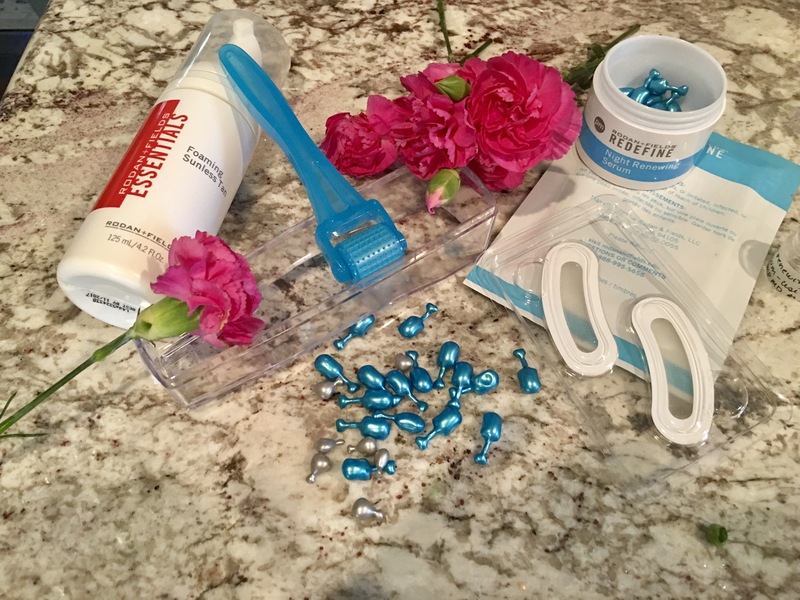 Looking for a quick way to jazz up an outfit? 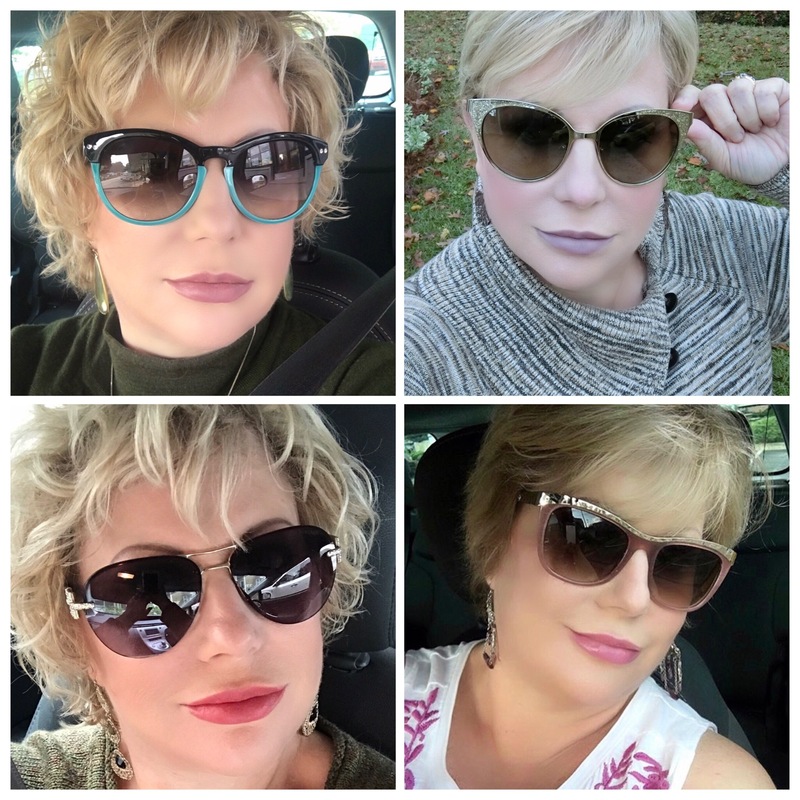 Reach for a great pair for of sunglasses! Right now, I’m contemplating what pair of sunglasses will be on my list for Santa. In the meantime, I’m enjoying my most recent scores: a jazzy, Hollywood-glam pair of Kate Spades that I picked up while post-Thanksgiving outlet shopping with my mom and sister and an ultra-elegant Versace pair that is a souvenir from a girls’ trip — coincidentally to Myrtle Beach — with college friends. In fact, here’s a photo of three of us modeling our finds. 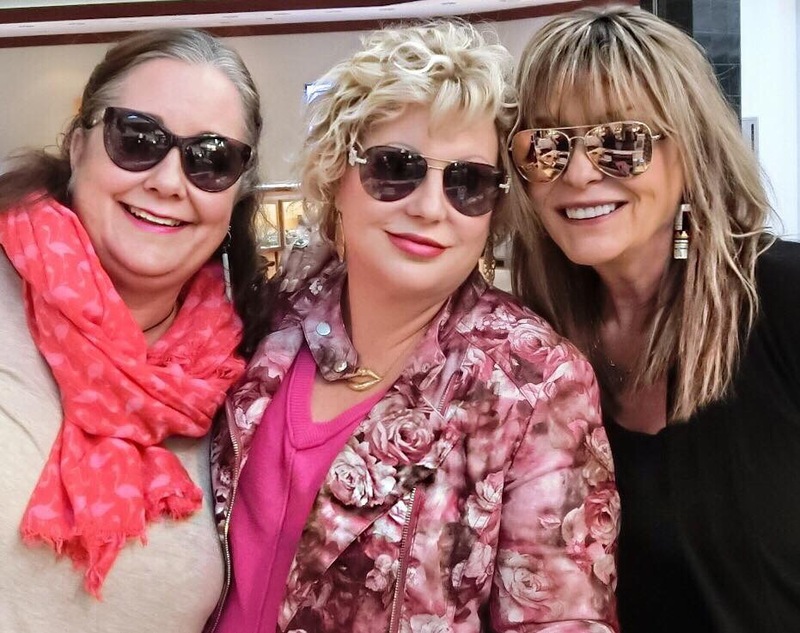 That’s Jeannean on the left in Versaces, me in the center, and Jill in Michael Kors. Phew! Some of y’all know I’ve been down in the dumps and fighting insomnia. I never sleep well when things are bothering me. My poor pillow knows. He’s been punched, pummeled, pounded and cried upon. Anyway, the past month has been an ick-fest: My son was in a serious car wreck, I felt abandoned by a good friend who happens to be the best boss ever, and I found a lump under my right armpit — the same side on which I had breast cancer. 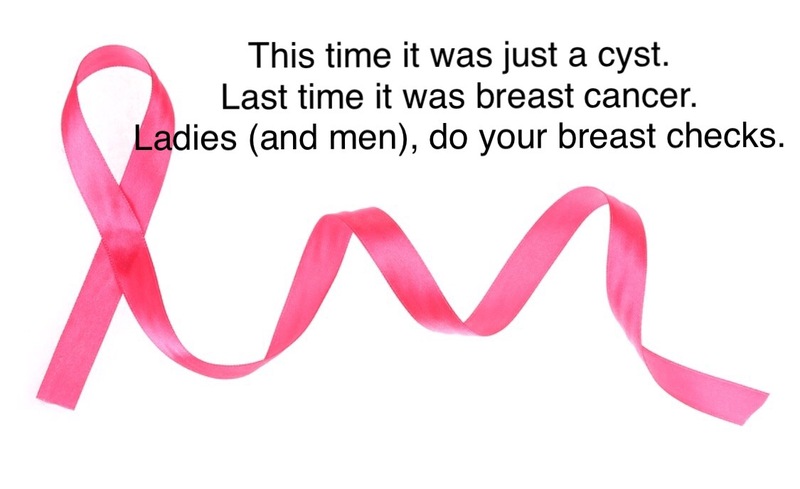 Did you know that one in eight women will be diagnosed with breast cancer? I, like my grandmother before me, was one of those eight. I found the lump at age 40 during an at-home breast check. I had a mastectomy with reconstruction followed by six months of chemotherapy. For 16 years, I was cancer-free. When I found a new lump, I immediately assumed the worst due to my medical history. And though it was probably a mistake, I kept the news to myself because I didn’t want anyone to worry. I confided only in my poor, afore-mentioned pillow. The good news? I learned today that the lump was merely a small, harmless cyst. The other good news? If it had been cancer, I would have caught it early because I do regular self-exams. So, please do me — and the people who love you — a big favor and start doing breast checks today. Oh, and the other good news? My son is going to be just fine. And I’ve decided that as much as I hate losing the best boss ever, Robie and I can be better friends without the boss part getting in the way. Summation? All is great in my world. I hope things are great in your world too. But seriously, do your breast self-check. Like right now.